James Gagnon is an Assistant Professor at the University of Utah, where he started his lab at the beginning of the year. 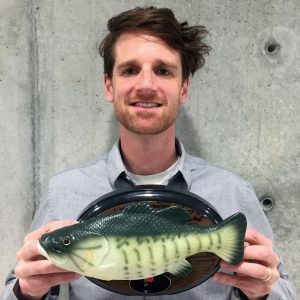 As a postdoc at Harvard, he developed methods for lineage tracing in zebrafish embryos, using CRISPR-Cas9 barcode editing. We caught up with Jamie to talk about his research, how science can be made more open, his enthusiasm for the preLights project and the fun sides of being a junior PI. What got you into biological research? Like many people, I just liked science as a kid but didn’t have a specific interest in biology until college. Then, as an undergraduate, when we started reading papers, they were often contradicting the textbooks – and that’s where it became interesting! I got really excited about being right at the limits of knowledge and realising that our understanding was far from complete. From then on, I tried to get more involved in research and later went to graduate school. During your postdoc in Alex Schier’s lab you were among the first to apply CRISPR-Cas9 to zebrafish. How did you get started with this technology? When the first studies using CRISPR in eukaryotes were published, we were just about to make over a hundred zebrafish mutants using TALENs. I went to Alex’s office and begged him that we try CRISPR just one time, and if it worked maybe we could consider using it. He agreed and it worked extremely well at the very first attempt. So, I took all the TALEN reagents that I spent about 5 months building, threw them in the back of the freezer and never touched them again. There’s also a lesson here: don’t get too committed to any one type of technology, because you never know what might be coming a few months later! As an engineer-type person I really enjoyed building these new reverse genetic tools – first the TALENs and then CRISPR. It was also clear from the beginning that there was a lot of opportunity to make them even better. You have used CRISPR-Cas9 technology in a very creative way to trace the lineage of cells during zebrafish development. Where did that idea come from? The secret behind this project is that one of the other co-first authors on this story is Aaron McKenna, and we’ve been friends for over 17 years. We were on a mountaineering trip in Northern Maine, and on the first day of the trip he mentioned his plans to use CRISPR to trace cells by making mutations. I told him that we really had to try this in zebrafish! Apart from being a great model organism for developmental biology, I already had a lot of CRISPR technology built out in zebrafish. He was stuck with me for three more days in the mountains, so I managed to convince him. After the trip, he sent me the DNA to make the transgenic fish, and within a year, the whole story was wrapped up and published. So, it was a combination of friends thinking about creative things, and what Alex Schier often calls ‘having a prepared mind’, that was crucial for starting this project. For many of your projects you’ve worked together with computer scientists – what are the key elements to successful collaborations between experimentalists and data scientists? One of the key things is to trust each other’s strengths, but also to find a common language to be able to communicate about all the different parts of a project. I know that often in such collaborations people may just focus on their own task, but I think it’s a lot more exciting to discuss everything, and I’m convinced it makes projects better. I’m also the type of person that sometimes won’t shut up, and I will ask the data scientists over and over again to explain until I understand them. You have put your three most recently published papers on bioRxiv; what has been the best experience about preprinting your work? One main advantage I experienced was that it helped coordinate one of our stories with another group. Apart from publishing at the same time and in the same journal, we were able to talk about the discrepancies between our work. This led both of us to do additional experiments, which made both of our papers better. We also managed to reach a mutual agreement on what Nanog – the transcription factor we were studying – is doing in zebrafish. This kind of communication sometimes happens at conferences, but the chances that Daria [corresponding author of the co-published Development paper] and I would meet at a conference before publishing the work were very slim. What impact do you think preprints have on changing the publishing and scientific culture? I think they will change the balance of power between authors and publishers. But I still think journals are super important – I read tons of journals! Also, you cannot post reviews or ‘News and views’ pieces, which are really important resources for the scientific community, on bioRxiv. What I really like about preprints though is that people won’t judge the work based on the title of the journal. The most important thing preprints are doing for the scientific culture is building a community of open science. This encourages us scientists to talk more openly at conferences about unpublished work, and helps people to collaborate or coordinate stories. Especially in recent times, when the pace of science seems to be getting faster and faster, the more openness we can have the better it is for everybody – and for everybody’s stress levels! To help science be more open, you have also been sharing some of your genome editing experiments on other platforms, such as Figshare. Could you tell us about that? I’m now experimenting with different platforms for sharing my data and sharing science. When I saw an amazing preprint [since then published] from the Giraldez lab – looking at Cpf1 – I reproduced one of the experiments from their work and shared the data on Figshare. I found this important because previously there was another genome editing tool called NgAgo, and many other people – including myself – invested time trying to get it to work in zebrafish, which never happened. I posted about this on Twitter as well. Because of what happened with NgAgo [the original research paper on NgAgo has been retracted], many people started questioning other CRISPR tools that were coming out, or just decided that they would not bother trying out these other new tools. You mentioned posting some of your data on Twitter. What values does social media like Twitter have for science? A really exciting thing about Twitter is that you can ask questions and get advice from some amazing people you would never bump into in your department or at conferences. I myself use Twitter as a really unique way to view a different side of science. I like to hear interesting ideas, but also the struggles of science or just random thoughts. The favorite people I follow are students and postdocs, who are in the trenches of science. I find their ideas really exciting! What was your main motivation to join the preLights project? I think Twitter is amazing for floating interesting things to the surface, but most of the tweets about preprints just include the titles. You very rarely get deeper thoughts or even a deeper rephrasing or contexting of the work. That’s why I think services like preLights are awesome! You can have a conversation about a piece of work and what the findings mean before the work is fully finished. So, to be part of the preLights team is a really cool opportunity and I want to make the most of it! What kind of preprints do you aim to highlight? I’m trying to highlight preprints that aren’t necessarily in my tiny world. I would like to use this opportunity to further read and learn new things. For example, for the first preLights post I wrote, I had to read some reviews on alternative splicing and neuronal gene expression. But I think I also managed to put the preprint in a slightly different context. Of course, many people are reading papers outside of their field; now preLights gives us all an opportunity to hear their thoughts. You have very recently opened your own lab. How has the transition from postdoc to PI been for you? It’s been super fun! I’m doing all sorts of things that I’ve never done before: buying PCR machines, building a zebrafish facility, hiring people, teaching undergraduates and showing them everything – several of them never had a pipette in their hands before. I have to wear so many different hats, I feel like I’m running a little start-up company! Ask me again in a few years and then I’ll see how tough it is, but right now it has just been so much fun. One of my favorite things I have done so far as a PI was call students on the phone to tell them they got into graduate school. I remember that receiving a phone call that I got into graduate school was a great moment in my life, and now being on the other end is really cool! What is the main focus of your new lab? As a start, we are trying to expand our CRISPR toolkit. The way I view it is that right now we have one knife that is super sharp and incredibly good at doing one thing. I would like to build a Swiss army knife, which can do much more. So, we are planning to work on regulating CRISPR activity, doing base editing, using self-targeting guide RNAs and so on. Once we have a good playground to play in we will be able to do a lot of cool science. Finally, tell us something people might be surprised to find out about you. My wife and I have had a long string of cats; right now we’ve got three. It’s funny, because initially when we had two cats they really hated each other, but then when we got the third cat it started neutralizing this hatred between the cats. Later, when we moved from Boston to Salt Lake City and drove 4000 miles in a big camper van, the cats bonded really well over the common enemy of the camper van – and now they all love each other!